Yum! Nothing says summer like fresh, pungent, mint family herbs! This tea is a mix of Peppermint, Yerba Buena (a native CA mint!) and Basil, all so flavorful as well as cooling and stimulating. These are combined with Violet leaves, Red Clover, and ilky oat heads to make a more moistening and hydrating brew that is also nutritive and chock full of minerals. I find an afternoon cup of mint tea can sometimes get me through a 3pm energy drop and back on my feet again (other days require coffee, no judgement!). This is also a good one to turn to if you are feeling dehydrated or have spent a long day in the sun. This tea is a shorter steep- as mints tend to get a little bitter if you brew them overnight as you would some medicinal teas. You can also try it as a sun tea. This beautiful and potent herb, harvested in the height of bloom at Root Down Farm, has so many uses. In low doses California Poppy can help soothe anxiety, panic and PTSD symptoms (for these uses, start with just 5-10 drops and increase the dosage from there as needed.) It is also an analgesic that can take the edge off of pain and Karyn Sanders recommends it for emotional pain that has taken a physical form. In larger doses (20-40 drops) this tincture will help you to fall asleep and sleep more deeply. It is a sedative, so don't take much if you will be driving or operating other machinery! and don't combine with pharmaceutical sleep aids. Avoid during pregnancy. Your liver is a powerhouse! It’s responsible for so much and connected to so much, and yet we think of it and tend to it so little! Most known for processing blood, it also aids in digestion, immune function, and waste disposal and is thought to have over 500 separate functions (depending on who you ask!) Because our livers do so much work, they can easily be overtaxed and the effects of this can show up in a wide variety of ways. Allergies, skin conditions like eczema and acne, headaches, digestive issues (especially difficulty digesting fats, or symptoms of digestion going the ’wrong way’ into heartburn, hiccups), PMS, and sleeplessness, can all be symptoms of liver imbalances, as well as symptoms more on the emotional end of the spectrum including, anger, frustration and irritability. So much could be pointing to your liver! This tincture is a tonic to support your liver, meant to be taken daily to support and increase your liver’s resilience over time. The main ingredient is burdock root- a humble plant that we love for it’s alterative (blood cleansing) properties and its support of the lymph system. Burdock is especially helpful for liver imbalance that presents as a skin condition or digestive upset. Reishi mushroom is another key ingredient- a strong antioxident and immune regulator, which essentially supports the liver by taking care of some of its work. Lavender and Yellow Dock round out this formula in small amounts as liver stimulants. Make sure to shake this tincture before you take it as the inulin from the Burdock will settle out and is a key part of the medicine! This essence is the first in our new line of energetic remedies. These remedies, made with essences and spirit doses of other plants, work on the emotional and spiritual level in subtle but profound ways. Thrive was created to match the vibrant energy of Summer and contains Borage for courage and joy, Calendula for connection and openness and Angelica to support a sense of fullness and confidence, especially for those who are overly self-critical. These essences were then added to spring water and preserved with Lavender and Tulsi infused Brandy for a delicious and brightening formula. Take 1-3 drops in water or under your tongue daily, or whenever you need a little boost. This salve is intended to help fade scars and repair tissue from both healed and fresh wounds, burns, incisions, etc. It’s got so much good stuff in it working together- Gotu Kola- which increases collagen production and helps heal connective tissue, Calendula, our go-to for tissue regeneration, Monarda- which pulls heat and inflammation, Skullcap which stimulates blood flow to the skin, and Echinacea which stimulates the body’sThealing response and limits the possibility of infection from more recent wounds. If you are using this on a burn, wait for the heat to pass before applying this salve or any oil based remedies. This tincture is intended to lift your mood/spirit while helping to soothe and support your nervous system. It has two herbs that we consider 'brightening'- Lemon Balm, which is helpful for nervousness/anxiety and seasonal affective disorder and Tulsi (also called Holy Basil) which supports depression and fatigue. Both of these herbs help stimulate appreciation if you are struggling to feel joy, can protect you from overstimulation, and will alleviate brain fog and promote mental clarity. Tulsi is an adaptogen, meaning it will help cultivate balance and make you more resilient in your ability to respond to stressors, and is considered a Rasayana herb in Ayurveda- an herb that is nourishing to the body as well as the spirit. We rounded out this tincture with Milky Oats, which provides structural repair to the nervous system, meaning it quite literally brings your frayed nerves back into alignment. It is especially helpful in times of exhaustion (often a sign that your nervous system is overtaxed), and for ongoing nourishment for folks who tend toward worry, fear, or stress. You can take this tincture in acute moments of stress or sadness, but it tends to be the most helpful when you taken daily during periods of ongoing stress, anxiety or depression. Dosage: 20-40 drops up to 3x a day. Not for use during pregnancy. Menthol chest rubs are great for breaking up chest and sinus congestion and soothing coughs, but commercially made vapor rubs are often petroleum based and contain synthetically made camphor, not our ideals for rubbing into your skin and breathing in! Our version is made with three simple ingredients- eucalyptus, olive oil and beeswax. We make a strong infusion of eucalyptus leaves and bark in olive oil, and add the beeswax to thicken it and add shelf stability. We don’t add essential oils because eucalyptus plant matter is very potent! Eucalyptus is highly antiseptic, antibacterial, and warming, in addition to alleviating congestion, it can also help to aid the relief of aches associated with cold and flu. Rub this balm into your chest and throat and breathe deeply. Do not apply it to your nose or any mucous membranes! This essence was created to support you as you move through times of grief and loss. It contains Rose Buds and Rose Petals to sweetly tend your heart and Peach Leaf, a soothing herb long used in Southern folk medicine for addressing grief. This remedy also holds spirit doses of Rosemary, for a protective hold, Comfrey, for grounding and integration, and Mimosa Flower for bringing comfort and joy into a heavy heart. Since this remedy is an essence, rather than a tincture, only small doses of 1 to 5 drops are needed. Essences are a powerful but subtle form of plant medicine, that call on the spirit or energy of the plant, (moreso than the phytochemicals utilized in a tincture.) If you are in the process of grieving we recommended taking a few drops daily, over time, to sense the support of these plants. The Summer already feels like it’s starting to pass here on this little coastal valley farm. A few days out from the Equinox, the days are still warm but the light has changed and the night comes on more briskly. The Summer season has treated us well, with abundant blooms and plenty of sunshine after last year’s very wet Winter. Now the blossoms turn to seed and soon the plants will start to put their energy into their roots, preparing for the colder seasons. Sometimes we look out on the beauty of the fields and the rolling hills and have a difficult time reconciling the wonder of our lives with the country’s deeper descent into overt fascism and racism. It feels important to acknowledge that while we are enraged and disheartened by the regressive and violent tactics being utilized both personally and structurally to maintain white supremacy, it is not new and we are not surprised. As white people, we are challenged to work towards dismantling systems of white supremacy while constantly acknowledging the ways that we benefit from them daily. When we look out on a lovely field of flowers on a clear day, we can allow ourselves joy, but not complacency. We know that there is work to be done, even on the most quiet days, especially in the pockets of our lives where we feel the most ease. We hope that this turn in the seasons finds you well and that you are finding ways to be in both the wonder and the work. Fire cider is a potent immunity tonic and this batch has horseradish from our garden, garlic and onions from Blue House Farm here in Pescadero, and ginger from Vang Family Farm in the Central Valley (ginger needs heat so it’s hard to grow on the coast) all infused in raw Apple Cider Vinegar. You can take a dose of it every day to keep you healthy or take a teaspoon every few hours at the first sign of a cold. Dilute it in water, tea or juice, sprinkle it on steamed veggies or put it in your salad dressing! This mushroom tincture is a mix of Reishi and Shiitake cultivated from Far West Funghi, and Turkey Tail that we gathered in the woods behind our garden in Pescadero. Medicinal mushrooms are great for strengthening the immune system, as well as knocking out a cold as soon as it starts. They are highly antiviral and will not only work against the common cold, but can also be used to treat HPV, HSV, HEP B and C, and HIV. They are also antibacterial, antifungal (good for candida), anti inflammatory (good for arthritis), and are widely renowned for their anti cancer properties (especially turkey tail and reishi). They are helpful liver cleansers too, which is an important part of keeping your immune system in good shape. Excellent for building deep immunity, we recommend taking a small dose of this tonic every day this Fall. Digestive symptoms are a very common health concern that allopathic medicine is not especially well equipped to aid. Fortunately, there are many plant allies that help soothe the digestive system in moments of agitation, and can help heal the gastrointestinal tract from inflammation and damage. We find this type of internal healing is best done with tea, allowing the medicine to pass through, and come in contact with, the internal areas in need of repair. This tea is made from peppermint and spearmint for cooling and settling, chamomile as a soothing bitter to get your digestive juices flowing, calendula for it’s wound healing properties, plantain for drawing out irritants, and marshmallow for moistening. It is a great addition for anyone living with chronic digestive issues or food allergies, or just a tasty tea to keep your GI tract in good shape. Folks with acid reflux may want to test this out before drinking a lot of it, as mints can sometimes aggravate some of the symptoms associated with acid reflux. To get the most out of your medicinal brew, you may want to let your tea steep longer to draw out more of the chemical constituents of the plants- 30 minutes to 8 hours (feel free to reheat it if you want to drink it warm), but a beverage steep of 5-30 minutes will still be medicinal as well! This remedy contains Elecampane root, dug from our garden, as well as Echinacea flowers in bloom in our garden beds right now. We then added these herbs to raw Oakland honey from Queen of Sheba Farm tended by Khaled Almaghafe, a fourth generation beekeeper. Honey, as always, is a powerhouse of antibacterial and anti-inflammatory properties- a helpful addition in every season but an especially strong ally in the Fall. Echinacea provides a strong immune boost though its antibacterial and antiviral properties and Elecampane is also antiseptic, helpful for bronchitis, bronchial asthma, and deep wet coughs. Take it at the first sign of a cold, or use it to help get over a cold or flu quicker. This honey is especially helpful if the illness has moved into your lungs, although if you have a dry cough another remedy would be best. You can add this honey to foods or tea, or eat it straight from the jar with a spoon. We have strained the honey but there might still be some herby bits- feel free to eat these too for extra medicine! Avoid if pregnant or breast feeding. This salt scrub has mugwort, black sage, garden sage and white sage, gathered from our garden and infused in olive oil, to nourish your skin after the salt pulls out toxins and sloughs off residual skin cells. We made this salt scrub thinking of Fall ritual, shifting seasons and shifting energy from some of the more external processes of the summer, towards a more inward process of Fall and Winter. Salt scrubs are a nice way to bring intention and ritual into the care you give to your own body, to slow down a more mundane practice of bathing and give extra attention and resilience to your skin. Our Spring tea blend is a mix of Stinging Nettles, Oatstraw, Violets and Meyer Lemon peels, created to build nutrients and prevent allergies. We harvested these wild nettles from a wooded creek in Pescadero where we have been returning for several years now. In the shade of willows and elders, these chlorophylll-rich plants grow large and in abundance. Stinging nettles are highly nourishing, full of an amazing amount of vitamins and minerals including A, C, E, K and easily absorbable forms of calcium, iron and protein. Nettles help to build your overall vitality and strength and are particularly helpful for the kidneys, adrenals, lungs and circulation. Stinging nettles are also an anti-histamine and regular use can help prevent seasonal allergies. Oatstraw is another nutrient-rich herb and is particularly nourishing to the nervous system while violets are full of minerals and support the lymph system. We’ve also added lemon peels to the mix for flavor and because they help to make the nutrients in these herbs more available for your body to absorb. For a medicinal brew use at a ratio of 1 tbsp of herbs per one cup of water. Pour boiling water over herbs, cover, and let steep for a minimum of 20 minutes, up to overnight (longer steeping will create a more potent infusion- especially for nettles.) or simply enjoy in the way that you usually prepare your tea. If you steep overnight, you can drink it cool or reheat your tea if you prefer it warm. Nettle tea will get (what we refer to as) ‘skunky’ if you leave it out for more than a day, so refrigerate it or drink it throughout the following day. Spring allergies can be anywhere from a nuisance to a completely debilitating experience. We formulated this Allergy Support Tincture to aid acutely in the moment of an allergy attack, as well as to serve as a tonic to the season as a whole. In many forms of plant medicine there is a principle that ‘like treats like’, and this formula falls very much into that vein. The two allergy relief plants are Goldenrod and Ragweed, two of the main culprits that cause Spring allergies! Both plants are anti-inflammatory and astringent and are intended to quell a histamine response while it’s happening. These will serve you best for allergies that present as runny nose and eyes, swelling, redness and inflammation. We’ve added burdock to help cleanse your liver and support your lymph system, helping expedite the processing of irritants. Burdock is rich in inulin (nature’s insulin) so if you see a layer of white on the bottom of your tincture bottle it’s simply the inulin settling out. Feel free to shake your tincture bottle to mix this powerful medicine back in. In addition to this, eating local honey and bee pollen is a great preventative, and nettles are a powerful allergy tonic (as mentioned above), so drink your Nutritive Tonic Tea! ++Dosage: 20-60 drops up to 3x a day or as needed at the onset of an allergy attack. +If you are taking insulin, consult a practitioner before use. Contraindicated while pregnant or nursing. Similar to Fire Cider in effect (but not taste!) Four Thieves Vinegar is a traditional tonic used to help strengthen the immune system. Fabled to have been used in the time of plagues in Europe, this anti-microbial vinegar containing the common garden herbs of rosemary, sage, thyme, lavender and peppermint, is both effective and versatile. (This has become one of our best-selling remedies, an unexpected underdog, and folks are always reporting back about the numerous ways they’ve added this vinegar into their diet!) Add its aromatic taste to salads, use it on cooked greens, or take 1/2 tsp up to 3x a day to stay healthy at the tail end of this cold and flu season. We formulated this skin cream to keep you supple as the sun re-emerges and weather begins to dry out! With emollient herbs rose and rose geranium and vitamin C packed rose hips, this cream is helpful for mild skin irritations like eczema and the dryness that comes with seasonal shifts, and also can be rejuvenating to the skin for scars, dark spots, and aging. It has olive oil, coconut oil, shea butter, beeswax and rose hydrosol to make it even more nourishing and moistening. This formula was created to help you to tap into the transformational energy of Spring and to engage with greater change- in your life and in your worlds. This spray contains the essence of burdock root, to help you to ground into purpose, mullein flower to help you to feel the feelings without getting stuck, and borage flower for the courage to act. These essences are added to spring water and preserved in a brandy that has been infused with rose buds to hold and strengthen your heart while doing this work. You can use this formula by spraying it onto your tongue or on specific points of your body, whenever you need support in instigating change. Tips for Winter: Warm it up! It is very important during this time of year to keep your body physically warm, with special attention to the head, neck and kidneys. Body heat is lost by exposed surface area, and the head tends to be exposed more often as folks forget to wear hats or hoods. So don’t go outside or go to sleep with wet hair, and don’t forget your hat! Your kidneys are hard at work cleaning and circulating your blood, and this circulation is imperative to keeping your body warm. So help out those little kidneys by keeping them warm and active! Kidneys are located at your lower back so a simple remedy to remember is to tuck in your shirt to avoid allowing cold air to travel up your back, while more active kidney support can be done by rubbing your lower back to warm it up, and to keep your kidneys active by drinking plenty of hot water and tea. We’ve been feeling this Fall coming for a little while now as the bird song in the morning wanes, and the plants in the field that have occupied so much attention begin to slow and self-tend so that we can turn our energies toward harvesting and medicine making. There is still residual movement and fire from the Summer, but the cooling quiet and stillness of Fall are also present in the air, held at a tension that makes a lot of space for both the introspection and action required in most creative practices. As the Fall Equinox approaches, this is a great time to start building your immunity and supporting your respiratory system in preparation for the colder and more sedentary months. It is also a moment for giving some attention to your liver and lymph system, to clean out and refuel while the energy of Summer is still here. As the plants start to put their energy into their roots and the trees begin to lose their leaves, this is also the season for letting go, for trying to release that which no longer serves us. With Lauren in the mountains of Appalacia and Finn on the farm and in the woods of Pescadero, we are excited to offer more tree medicines in this Fall’s Seasonal Medicine Share along with a number of immunity tonics to help keep you in balance. If there is anything from previous years that you’re missing, we have a lot of single remedies for sale in the shop, or you can always feel free to contact us with requests. This tea mix contains a number of herbs from our garden to help strengthen your immune system this Fall. The lemon balm leaves and yarrow flowers in this blend have strong anti-viral properties, the chamomile flowers are antibacterial and anti-inflammatory and the calendula flowers are antibacterial while also supporting the lymph system. We’ve also included mullein leaves in this blend for some important lung support. This tea can help to prevent a cold, ease sinus congestion, break a fever or sweat out a bug. You can drink this tea daily as preventative medicine or at the onset of a cold or flu. For a medicinal brew use at a ratio of 1 tbsp of herbs per one cup of water. Pour boiling water over herbs, cover, and let steep for a minimum of 20 minutes, up to overnight (longer steeping will create a more potent infusion.) Or simply enjoy in the way that you usually prepare your tea! Not recommended during pregnancy. This immune boosting antibacterial and antiviral formula contains Elder flowers from San Francisco, Yarrow flowers from our garden in Pescadero and Echinacea leaves and flowers from the gardens at Medicine County Herbs in North Carolina where Lauren has been studying and working. Like most herbal remedies, this formula is most effective to take at the first signs of a cold or flu. It can also help you to get over a bug quicker, reduce a fever, act as a decongestant and help with a sinus infection. Living among the Willows that line the creek at Root Down, Finn has learned to appreciate these trees for their vibrancy and resiliency. Growing along waterways, they help to prevent soil erosion, provide dense habitat for birds and are vigorous growers. (Trees we pruned back in Winter have grown six feet or more this Summer!) Willows root incredibly easily and their pliability has made them an ideal source for traditional basket weaving. This Willow essence helps us to connect to these qualities of flexibility and resiliency, to dissolve our resistance to change and more easily adapt to the present. The watery nature of this plant also helps us to release old grief and guilt. Fall is a time of letting go before moving into the dark of the year and Willow Essence can be a sweet support to us in this process. This sweet and zesty remedy is packed with Vitamin C from organic Bay Area orange peels and the new Spring growth of Douglas Fir needles, gathered from stately old trees growing near Root Down Farm. These peels and tips were then added to raw Oakland honey from Queen of Sheba Farm tended by Khaled Almaghafe, a fourth generation beekeeper. Honey, as always, is a powerhouse if antibacterial and anti inflammatory properties- a helpful addition in every season but an especially strong ally in the Fall and Winter. You can add this honey to foods or tea, or eat it straight from the jar with a spoon! We have powdered some of our favorite savory herbs growing on the farm- sage, thyme and rosemary- and mixed them with grey french sea salt for a preventative medicine that you can sprinkle on any dish. Most culinary herbs are strongly antibacterial since they were traditionally used to preserve foods prior to refrigeration. So add a delicious dose of cold and flu prevention to soups, stocks, veggies or meats. Aloe Vera is a useful plant to have on hand and it does well in a pot, even on a windowsill if you don't have an outdoor spot. If you find yourself with a minor burn or sunburn, simply harvest a leaf of the plant and remove the skin from one side (being cautious with the spikes.) Slather the goo from inside the leaf on your skin every few hours to get relief and aid in healing. 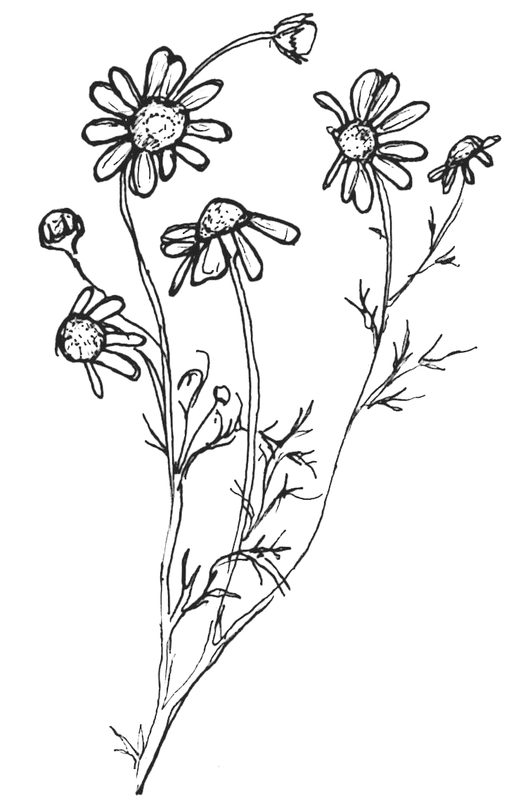 The sweet chamomile flower is a really healing plant for skin damage and burns. To make a chamomile foment, pour one quart of boiling water over 1 cup of dried chamomile flowers. Let steep one hour then strain and cool. Dip a washcloth into this cooled tea and apply to the affected skin. You can also include chamomile tea bags in your first aid kit to have on hand when traveling. Apple Cider Vinegar, diluted in water, can help to cool and soothe sunburns. According to Kami McBride, Apple Cider Vinegar (ACV) that has been infused with rose petals is even more effective. You can steep 1/2 cup of fresh rose petals in 1 cup of ACV and leave in a cool, dark place for a month before straining the roses out. Pour the rose vinegar into a spray bottle to have on hand for misting sunburns and agitated skin. Calendula flowers are soothing to minor burns and inflammation, speed tissue repair, and help the itching that can accompany peeling skin. When first recovering from a sunburn it’s best not to use an oil based remedy. But once you have cooled your skin with one of the methods above, using a calendula based salve or infused oil can help your skin to heal more quickly. Calendula is also an easy to grow plant and the more you harvest the flowers, the more they will bloom! Add 1/c cup of this mix to your water bottle or drink straight if you're really in need! Marshmallow root is cooling and moistening and deeply hydrating for those of us who tend to run dry or get easily dehydrated. It is strongest when brewed as a cold infusion. To do this simply put 1/2 cup of dried root in a quart jar and fill with cold water. Leave to steep for 2-8 hours before straining- being sure to press out all that medicinal goo! Marshmallow tea can go off quickly so store it in the fridge to avoid spoiling. Oats are a slow acting tonic that specifically act as food to the nervous system. Wild and domestic Oats are "milky" for only a short period of time each year (after they've flowered but before the seed have formed) and tincturing fresh oat heads in this stage makes for the strongest medicine. This tincture helps to repair frazzled nerves, support stressed adrenals, and ease anxiety and depression. It can also be helpful in recovering from addiction and is supportive during chronic illness. Milky Oats tincture is so gentle that it can combined with any kind of medication. This remedy is at its most powerful when taken consistently over time, but Finn has found that it also helps in moments of acute stress or anxiety or even just when going into a crowd. Taken in small spirit doses, it can return a sense of lightness and play. Dosage: 20-40 drops up to 3x day. Avoid if you have celiac's disease. This Summer tea blend is a mix of several mint varieties, lemon verbena and a touch of lavender- all grown and gathered in Pescadero in the late Spring. This tea is cooling and refreshing, helpful for rehydrating on a hot day and bringing some energy on a drowsy afternoon. Medicinally, this mix is excellent for aiding digestion or calming an upset stomach or nausea (although it’s not recommended if you have a lot of stomach acid or reflux.) It is both energizing and soothing to the nerves and it can ease minor headaches especially those caused by heat or sun. Feel free to try brewing it as a sun tea outside or in a sunny window. This beautiful and potent herb (harvested in the height of bloom at Root Down Farm) has so many uses. In small doses California Poppy can help soothe anxiety, panic and PTSD symptoms (for these uses, start with just 2 to 5 drops and increase the dosage from there as needed.) It is also an analgesic that can take the edge off of pain and Karyn Sanders recommends it for emotional pain that has taken a physical form. In larger doses (20-60 drops) this tincture will help you to fall asleep and sleep more deeply. It is a sedative, so don't much if you will be driving or operating other machinery! and don't combine with pharmaceutical sleep aids. Avoid during pregnancy. A ‘hydrosol’ refers to a steam distillation of a plant and we used our new copper still to gather the steam and essential oils of one of our favorite herbs. Lemon Balm is growing in abundance on the farm and we used it in this remedy because it is calming, cooling and antiviral! Finn learned once that a lemon scent goes straight to our limbic system which is why the smell of this plant can be so powerful. To cool down after a hot day or too much time in the sun, simply mist your skin. It can also be used as a gently astringent toner or breath in the spray to take in the calming scent in moments of stress. We like this culinary vinegar both for its taste and its rosy look. Lauren harvested these purple Spring blossoms from her backyard garden and infused them in Rice Vinegar to preserve their color. Chives are loaded with Vitamin A and C and also contain many minerals including Iron and Calcium. Add this vinegar to salad and veggies or take a teaspoon to fight any summer bugs you might encounter. We have found this spray to be one of our most useful remedies! Originally created for our First Aid Kit to prevent infections in scrapes and wounds, we’ve discovered that it has all kinds of uses. Need a sand sanitizer? Have athletes foot? Forgot your deodorant? Getting a rash? This strongly antibacterial and antifungal spray will take care of pretty much any skin related condition. Helpful to keep in your pack or in your car, simply spray it on the affected area as often as needed. Not for internal use. This all-purpose salve will help to heal wounds, prevent infection, heal bruising, prevent scarring and ease skin pain and irritation. Apply as often as you'd like to bites, rashes, scrapes and cuts (after first washing any wounds.) This salve can also be applied to burns after they have thoroughly cooled to the touch and we've gotten feedback that it's quick to heal external candida. This is another handy remedy to keep with you this Summer to care for yourself and others. Tender young greens are sprouting up all over the place right now (in the Bay Area at least!). We love this time of year as some of our favorite perennial and wild leafy greens start to leaf out and become available for colorful salads or just lightly wilted at the end of cooking. There are many benefits to eating seasonally with fresh produce from farmer’s markets and CSA’s. There is also a beauty to eating the wild foods that grow around you, and Spring is the season when wild edible plants are most abundant and the most tender. Some of our favorites coming up right now are Stinging Nettles, Nasturtium, Sorrel, Shungiku (Edible Chrysanthemum), Dandelion, Chicory, Miner’s Lettuce and Chickweed. It’s important to know which plants are poisonous (like hemlock!) and which are edible so go on a plant walk with someone who knows or check out a field guide, like The Flavor of Home by Margit Roos-Collins. An herbal vinegar is a way to get the benefits of a plant without eating it directly, in case you don’t find wild greens to be super palatable. By making an herbal vinegar you are essentially creating a tincture that you can use in your cooking in an everyday way. To make Stinging Nettle Vinegar, harvest a large bowl full of Stinging Nettles (while wearing gloves and a long sleeved shirt!) Chop the nettles up finely and place them in a clean mason jar. Top the jar with raw apple cider vinegar. Use a piece of plastic wrap or wax paper to cover the mouth of the jar before screwing on the lid so that the metal of the lid doesn’t corrode from the acidity of the vinegar. Label your jar and leave out of direct sunlight for 4-6 weeks. When 4 -6 weeks have passed, strain your infused vinegar with cheese cloth or muslin and store in a glass jar. Add this nutrient rich vinegar to cooking greens or salad dressings whenever you think of it. You can also use it diluted on your scalp for dandruff! Bitters are an important, and often overlooked, part of a healthy diet because they help to stimulate your digestion and support your liver. Here is a way of preparing dandelion greens that cuts the bitter taste without taking away the bitter effect. Blend everything in a food processor until it reaches the texture you like for pesto. Add to eggs, toast, pasta, rice, etc! Our Spring tea blend is a mix of Stinging Nettles, Oatstraw and Tulsi, created to build nutrients, prevent allergies, soothe your nervous system and kick the winter blues! We harvested these wild nettles from a wooded creek in Pescadero where we have been returning for a few years now. In the shade of willows and elders, these chlorophylll-rich plants grow large and in abundance. Stinging nettles are highly nourishing, full of an amazing amount of vitamins and minerals including A, C, E, K and easily absorbable forms of calcium, iron and protein. Nettles help to build your overall vitality and strength and are particularly helpful for the kidneys, adrenals, lungs and circulation. Stinging nettles are also an anti-histamine and regular use can help prevent seasonal allergies. Oatstraw is another nutrient-rich herb and is particularly nourishing to the nervous system. (Wild Oats are also thought to increase the libido, perfect for a little Spring friskyness!) Tulsi is known for bringing vitality and helping the body adapt to stress, and it provides a nice taste for the tea. The effects of all of these plants are cumulative, so drinking this tea with some regularity will increase the benefits. +Avoid during pregnancy or when breast feeding. Dosage: 20-60 drops up to 3x a day or as needed. +If you are taking insulin, consult a practitioner before use. Use with caution if you have a latex allergy. Similar to Fire Cider in effect (but not taste!) Four Thieves Vinegar is a traditional tonic used to help strengthen the immune system. Fabled to be used in the time of plagues in Europe, this anti-microbial vinegar containing the common garden herbs of rosemary, sage, thyme, lavender and peppermint, is both effective and versatile. Add its floral taste to salads, use it on cooked greens, or take 1/2 tsp up to 3x a day to stay healthy at the tail end of this cold and flu season. This salve is helpful in so many ways! From soothing dry, irritated skin to easing long term issues like eczema and psoriasis. Calendula alone is a powerful herb for all skin conditions and this plant promotes tissue repair, helps scars, eases rashes and heals scrapes. Chamomile is often overlooked because of its gentle reputation but this herb is strongly anti-bacterial, anti-fungal and anti-inflammatory. Try out this versatile salve on diaper rash, new tattoos, scrapes and even staph. Apply it externally to skin as often as needed. This formula was created to help you to connect to the transformational energy of Spring. Milkweed is the primary food of monarch butterflies and its flower essence supports the often challenging, and sometimes painful, work of growth and change. This flower essence was created with Finn’s classmates at the Blue Otter School of Herbal Medicine in the school’s incredible garden, alive with the new growth of Spring, many pollinators, and the snow on Mt. Shasta in view. This essence was then added to spring water and preserved in a brandy that has been infused with jasmine and apple blossoms and honey from Lauren's backyard hive. You can use this formula by spraying it onto your tongue or on specific points of your body, whenever you need a little support in meeting the transformative power of Spring. Many peoples, traditions and cultures have burned plants throughout time as a form of prayer, offering and medicine. "Smudging" is a popularized term for the act of burning herbs to clear energy from people, objects and spaces. We have included lavender in your share because it is a plant which resonated with us in terms of the Spring season- sending energy outward, growing, blooming. Lauren finds that burning lavender is helpful to coax or revive her artistic process, often using it to smudge her work space and invite the spirit of creativity. We also wanted to let you know that there is currently a call out from some Native American healers asking for people who aren’t of Native decent to discontinue the use of White Sage- since there is currently a shortage- to ensure that there is enough left for it to be used in the traditional way. Use a smudge bundle by lighting the end, letting it burn for about 10 seconds, and then gently blowing out the flame but leaving the embers glowing as the smoke should start to flow. Hold your lavender bundle over a fireproof container to collect burning ash (a simple glass or ceramic bowl works well) and direct the smoke with your hand, wafting it toward your body. Close your eyes and set an intention or offer a prayer. To smudge a room, you can start at the door and move slowly clockwise, wafting the smoke as you move, spending a little extra time in the corners. When finished, be sure to fully extinguish the smudge bundle by stamping it out in your bowl until there is no more smoke (you can add a little sand to the bowl to make this easier). Just as washing your hands can help keep you healthy, washing your sinuses and your throat can also be another defense from viral and bacterial infections. Using a neti pot or a syringe to flush out your sinuses with a warm salt water mix, as well as gargling salt water for a few moments, is a good idea if you’ve been on an airplane, in a crowd, or are caring for snotty kids or adults! You can flush out a cold right at the onset, or get rid of a lingering cold that you can’t seem to shake, by encouraging your body to sweat. Inducing a sweat will help you shed toxins, break a fever and increase your circulation, which will help your immune system really get to work! Diaphoretic (sweat producing) herbs that are great for making a tea to take internally are yarrow, peppermint, and elderflower- these can be taken together as a mix or individually. Other common diaphoretic herbs are mugwort, cayenne and cinnamon. These can also be made into a tea and taken internally, or used externally in a bath or foot soak. When you are starting to get ready for bed, brew a strong cup of tea, allowing the herbs to steep covered for 5-10 minutes, but ensuring that you drink the tea while it is still fairly hot. Drink the tea while you soak in a hot bath. Dry off, get in bed and wrap yourself in heavy blankets. Go to sleep and sweat it out, and wake in the morning feeling better! It is very important during this time of year to keep your body physically warm, with special attention to the head, neck and kidneys. It is believed in Traditional Chinese Medicine that cold enters the body through the back of your neck where your bladder and small intestine meridian channels run close to the surface of the skin. A simple remedy for this is to bundle up and always wearing a scarf in cold weather, even when you don’t feel that you need one. Body heat is lost by exposed surface area, and the head tends to be exposed more often as folks forget to wear hats or hoods. So don’t go outside or go to sleep with wet hair, and don’t forget your hat! Your kidneys are hard at work cleaning and circulating your blood so help out those little kidneys by keeping them warm and active! Kidneys are located at your lower back so a simple remedy to remember is to tuck in your shirt to avoid allowing cold air to travel up your back, while more active kidney support can be done by rubbing your lower back to warm it up, and to keep your kidneys active by drinking plenty of hot water and tea. This delicious tea mix has a number of herbs to support your immune system while also warming you up on a cold day! Ginger roots and elderberries are both antiviral and antibacterial, while rose hips and orange peels offer a boost with their high Vitamin C content. This tea is most potent when prepared as a “decoction”- the brew method used by herbalists to prepare woodier plant parts like roots, berries and bark. To brew your tea as a “decoction” simply add 1 tablespoon of herbs to 2 cups of water in a pot and bring to a boil. Once your mixture has begun to boil, cover the pot and turn the heat low to simmer your tea for 20 minutes or longer. This cooking time allows for the herbs to better infuse their medicine into your tea. Feel free to experiment with the quantity of herbs to water to get a ratio that suits your taste. Use this delicious and potent antiviral remedy at the first sign of a cold or flu, or if you’ve already caught something. This elixir is more effective when taken in frequent small doses, rather than occasionally taking larger dosages. We recommend taking 20-30 drops every couple of hours when your immune system needs some extra help. Finn thinks this remedy tastes so good that they place the drops directly into their mouth, but feel free to also add it to water, juice or tea. We’ve included this tincture in your share because this time of year can often bring travel and heavy meals- two things that can be hard on the digestive system. This gentle antispasmodic formula of peppermint, ginger and fennel eases indigestion, gas and bloating and is incredibly effective for nausea. It works well before a meal to get your digestive juices primed, preventatively for motion sickness or at the first sign of tummy troubles. We recommend starting with 15 drops but you can take up to 60 drops if you’re really needing some extra help. Menthol chest rubs are great for breaking up chest and sinus congestion and soothing coughs, but commercially made vapor rubs are often petroleum based and contain synthetically made camphor, not our ideals for rubbing into your skin and breathing in! Our version is made with three simple ingredients- eucalyptus, olive oil and beeswax. We make a strong infusion of eucalyptus tips (the young green branches) in olive oil, and add the beeswax to thicken it and add shelf stability. We don’t add essential oils because eucalyptus plant matter is very potent! Eucalyptus is highly antiseptic, antibacterial, and warming, in addition to alleviating congestion, it can also help to aid the relief of aches associated with cold and flu. Rub this balm into your chest and throat and breathe deeply. Do not apply it to your nose or any mucous membranes! Since willow is a blood thinner we do not recommend using this if you have hemophilia. This should also not be given to children with the chicken pox or the flu because of the rare disease of Ray’s Syndrome. Soaking in epsom salt and sea salt helps your body to relax while removing toxins from your system. Sage is a powerful anti-bacterial herb and adding it to your bath can help keep colds away. Sage is also a plant associated with cleansing in many different traditions and we’ve added some flower and gem essences to the mix to help you let go of what no longer serves you. Simply place salts in your bath as the water is running, using as much or as little as you’d like. We recommend using a drain catcher to gather up the plant material at the end of your bath. A facial steam is a simple way to simultaneously clear, cleanse and soothe congestion and irritation in your sinuses, throat and chest, opening up all of your facial passageways and allowing the medicine to absorb directly into the irritated tissue. We’ve included a mix of herbs that are both aromatic and antimicrobial for this purpose. To create a facial steam, boil a quart or more of water in a pot and then turn off the heat, adding some of the herbal steam mix to the pot before covering with a lid and leaving for 5 min. Then place the pot on a table or surface where you can comfortably lean over it. Open the lid (be careful of the initial burst of hot steam) and place a large towel over your head and the pot, creating a tent to trap the steam. Close your eyes and hold your head a comfortable distance from the heat of the steam (typically 8-12”). Breathe deeply through your nose and mouth for 5-10 minutes. Then blow your nose and enjoy less congested sinuses! We just sent off elderberry tinctures to the staff of Causa Justa :: Just Cause and The TGI Justice Project to support folks at these two awesome Bay Area nonprofits in staying well through this cold and flu season. There's more info about each organization below- please consider supporting as you can! Causa Justa :: Just Cause is a multi-racial, grassroots, base-building organization. We organize Black and Latino working class communities in Oakland and San Francisco around a vision of a society based on self-determination, social justice, and solidarity. We challenge gentrification and displacement by building people power to win housing and immigrant rights. Join our work today by donating, coming to an upcoming action, or becoming an intern or volunteer! We are especially looking for supporters to sign up as monthly sustainers to help our work thrive. TGI Justice Project is a group of transgender people—inside and outside of prison—creating a united family in the struggle for survival and freedom. We work in collaboration with others to forge a culture of resistance and resilience to strengthen us for the fight against imprisonment, police violence, racism, poverty, and societal pressures. We seek to create a world rooted in self determination, freedom of expression, and gender justice.